ادبی فیروزجاه, حسن, موسوی گزافرودی, سید محمد, فرشاد, سیامک. (1396). استفاده از جبران ساز توان استاتیکی ترکشن AC با در نظر گرفتن انرژی ترمز باززایی قطار. فصلنامه علمی - پژوهشی مهندسی حمل و نقل, 9(1), 37-50. حسن ادبی فیروزجاه; سید محمد موسوی گزافرودی; سیامک فرشاد. "استفاده از جبران ساز توان استاتیکی ترکشن AC با در نظر گرفتن انرژی ترمز باززایی قطار". فصلنامه علمی - پژوهشی مهندسی حمل و نقل, 9, 1, 1396, 37-50. ادبی فیروزجاه, حسن, موسوی گزافرودی, سید محمد, فرشاد, سیامک. (1396). 'استفاده از جبران ساز توان استاتیکی ترکشن AC با در نظر گرفتن انرژی ترمز باززایی قطار', فصلنامه علمی - پژوهشی مهندسی حمل و نقل, 9(1), pp. 37-50. ادبی فیروزجاه, حسن, موسوی گزافرودی, سید محمد, فرشاد, سیامک. استفاده از جبران ساز توان استاتیکی ترکشن AC با در نظر گرفتن انرژی ترمز باززایی قطار. فصلنامه علمی - پژوهشی مهندسی حمل و نقل, 1396; 9(1): 37-50. برای برطرف کردن مشکلات کیفیت توان در شبکه ترکشن از جبران­ساز توان استاتیکی ترکشن1 (RPC) در حضور ترانسفورماتور 11YΔ استفاده شده است. در این مقاله از قابلیت ترمز باززایی قطار و برگشت توان بهره گرفته شده است. به منظور برگشت توان در مدل بار ترکشن از یک پل تمام کنترل‌شونده استفاده می‌شود و ضرایبی مشخص به معادله جریان بار ترکشن اضافه می‌گردد. 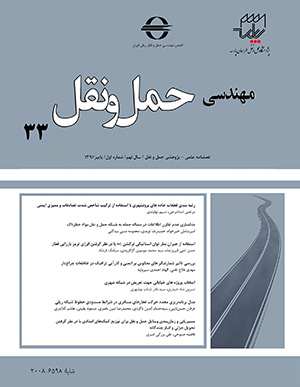 ترکیب قابلیت برگشت توان قطار و استفاده از RPC، به افزایش راندمان سیستم و بهبود کیفیت توان شبکه کمک می‌نماید. مرجع معادلات در طرح کنترلی سمت ثانویه ترانسفورماتور در نظر گرفته می‌شود. در این طرح کنترلی جریان‌های مرجع اکتیو و راکتیو و هارمونیکی از یکدیگر جدا شده و نیز از یک کنترل‌کننده PI برای ثابت نگه داشتن ولتاژ خازن لینک DC استفاده می‌گردد. نهایتاً با اعمال این طرح کنترل پیشنهادی، توالی منفی و هارمونیک جریان جبران شده و ضریب قدرت شبکه بهبود می‌یابد. به منظور اثبات صحت عملکرد تئوری جبران‌سازی مطرح شده، جبران‌ساز RPC توسط نرم‌افزار MATLAB/SIMULINK شبیه‌سازی شده و اعتبارسنجی می‌گردد. Depenbrock, M. and Staudt, V. (1998) "The FBD-method as tool for compensating total nonactive currents," in Harmonics and Quality of Power Proceedings, 1998. Proceedings. 8th International Conference On, pp. 320-324. - Falvo, M., Lamedica, R., Bartoni, R. and Maranzano, G. (2010) "Energy saving in metro-transit systems: impact of braking energy management," in Power Electronics Electrical Drives Automation and Motion (SPEEDAM), 2010 International Symposium on, pp. 1374-1380. - Gelman, V. (2009) "Braking energy recuperation", Vehicular Technology Magazine, IEEE, Vol. 4, pp. 82-89. - Guiping, Z., Jianye, C. and Xiaoyu, L. (2008) "Compensation for the negative-sequence currents of electric railway based on SVC," in Industrial Electronics and Applications. ICIEA 2008. 3rd IEEE Conference on, pp. 1958-1963. - Guo, W., Enen, R. and Mingxing, T. (2008) "A hybrid active compensation method for current balance based on Y, d11 connection traction transformer", Power Electronics and Intelligent Transportation System, 2008. PEITS'08. Workshop on, pp. 582-586. - Holmes, D. G., Davoodnezhad, R. and McGrath, B. P. (2011) "An improved three phase variable band hysteresis current regulator," in Power Electronics and ECCE Asia (ICPE & ECCE), 2011 IEEE 8th International Conference on, pp. 2274-2281. - Horita, Y., Morishima, N., Kai, M., Onishi, M., Masui, T. and Noguchi, M. (2010) "Single-phase STATCOM for feeding system of Tokaido Shinkansen,", Power Electronics Conference (IPEC), 2010 International, pp. 2165-2170. - Kulworawanichpong, T. (2004) "Optimizing AC electric railway power flows with power electronic control", Birmingham: University of Birmingham. - Lee, J., Lee, H. and Kwak, J. (2008) "A study for improvement performance of electric brake for electric train", in Control, Automation and Systems, 2008. ICCAS 2008. International Conference on, pp. 1345-1348. - Luo, A., Wu, C., Shen, J., Shuai, Z. and Ma, F. (2011) "Railway static power conditioners for high-speed train traction power supply systems using three-phase V/V transformers", Power Electronics, IEEE Transactions on, Vol. 26, pp. 2844-2856. - Morimoto, H., Ando, M., Mochinaga, Y., Kato, T., Yoshizawa, J. and Gomi, T.,,,… (2002) "Development of railway static power conditioner used at substation for Shinkansen,", Power Conversion Conference,. PCC Osaka. Proceedings of the, pp. 1108-1111. - Sirbu, I., Nicolae, P. and Bojoi, R. (2010) "Solution for the power quality improvement in a transportation system", in Power Electronics and Motion Control Conference (EPE/PEMC), 2010 14th International, pp. T11-32-T11-37. - Tan, P.-C., Loh, P. C. and Holmes, D. G. (2004) "A robust multilevel hybrid compensation system for 25-kV electrified railway applications," Power Electronics, IEEE Transactions on, Vol. 19, pp. 1043-1052. - Terciyanli, A., Acik, A., Cetin, A., Ermis, M., Cadirci, I., Ermis, C., ... (2012) "Power quality solutions for light rail public transportation systems fed by medium-voltage underground cables”, Industry Applications, IEEE Transactions, Vol. 48, pp. 1017-1029. - Uzuka, T., Ikedo, S. and Ueda, K. (2004) "A static voltage fluctuation compensator for AC electric railway," Power Electronics Specialists Conference, PESC 04. 2004 IEEE 35th Annual, pp. 1869-1873. - Vasanthi, V. and Ashok, S. (2011) "Harmonic filter for electric traction system," in Innovative Smart Grid Technologies-India (ISGT India), 2011 IEEE PES, pp. 282-286. - Wu, C., Luo, A., Shen, J., Ma, F. J. and Peng, S. (2012) "A negative sequence compensation method based on a two-phase three-wire converter for a high-speed railway traction power supply system," Power Electronics, IEEE Transactions on, Vol. 27, pp. 706-717.